Scandinavian rosewood side tables or night stands by Severin Hansen & Halsev Mobelsnederi, Denmark. Perfectly refinished. 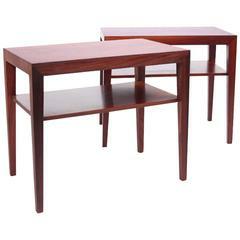 Pair of Borge Mogensen teak nightstands for Soborg Mobler, Denmark. In very good vintage condition, labelled. 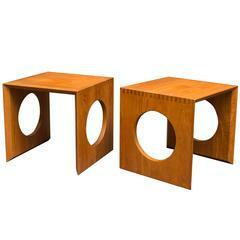 Pair of Jens Quistgaard design sculptural design teak side tables for Richard Nissen, Denmark. Simple and refined design with dovetail construction and beveled edges. T.H. 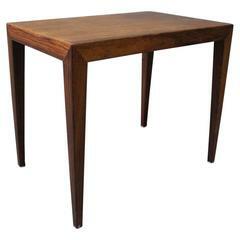 Robsjohn-Gibbings design x-base mahogany lamp table for Widdicomb Furniture co. Newly refinished and labeled. 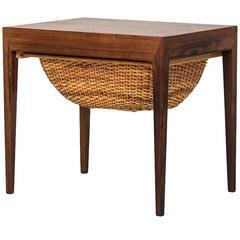 Danish side table by Severin Hansen in rosewood. Great quality of work. Side or sewing table designed by Severin Hansen. Produced by Haslev Møbelsnedkeri in Denmark. Rare side table designed by Severin Hansen. Produced by Haslev møbelsnedkeri in Denmark. Small side table in rosewood designed by Severin Hansen for Haslev Furniture Factory in the 1960s.